A brief history of a small, but famous, Italian motorcycle marque. MOST people choose their profession out of interest in a certain trade and earn their living in that field. Few are able to switch to a complete other kind of work, let alone that they become succesfull One of them was notary's son Pietro Ceccato, born in 1905 in Montecchio Maggiore near Vicenza in northern Italy. He finished his study as a medical doctor and started working as pharmacist. In his spare time he played on different musical instruments and was also interested in electronics and technical subjects in general. His first technical creation was a music stand with a foot pedal to switch the pages with. Motorcycling also had his interest and road racing in particular. He started racing on a Moto Vicentini, a company later taken over by Gillet-Herstal. With a 350 Velocette he attracted more attention and Rudge offered him a 500 cc racer to use. That resulted in the Italian championship in 1933. Teodoro Galelli Argentina Argentina's 1959 75cc champion Teodoro Galelli. Insert: Ted, as he is called at present, enjoying life in California. After his first daughter - Adriana - was born he quit the racing scene and concentrated on music for a while. He sold his house in 1934 to have cash to start the production of office materials. The results allowed him to purchase a building area of 10.000 m2 in the "Alte" district of Montecchio Maggiore to start a factory for quality products of which he thought the public was in need of. Mainly electric bread ovens and the assembly of different kind of engines. Immediately after the war was over he started making air compressors , hydraulic car lifts and other garage equipment. It was the "La Construzione " period and the Italians were badly in need of cheap means of transportation. The "Romeo", a sporty sparkling red motorized bicycle, with a 38 cc 2-stroke roller engine above the rear wheel , was introduced. Followed up by a 48 cc engine in 1948. In 1951 a 49 cc 2-stroke moped was introduced and also a 75 cc 2-stroke motorcycle. Soon these got company of a 100 -, 125 -, and later on a 175 cc version. All these models were tested at Ceccato's own testing track and the first models were mostly sold to their own workers. At the start of 1953 also a 200 cc horizontal 2-stroke twin was introduced. This engine looked almost identical to the Motobi 'Catria'. Whichever was first remains a question. The factory 's surface area was enlarged to 16.000 m2 and the number of personnel would rise to 700. Because Pietro was such a large local employer and his personnel management was very social, the town district's name "Alte" was popularly called "Alte Ceccato", which later became the official name. Because of Pietro's racing passion the Milan-Taranto and Motogiro d'Italia long distance races were entered in 1953. Two 75 cc and two 125 cc bikes were entered and they did finish somewhere behind the first ranks. That was not enough; to boost sales it was absolutely clear to Pietro that he needed a winner. The young engineer Fabio Taglioni had just designed an interesting 75 cc ohc racing engine at Bologna's polytechnical institute. Contrary to popular belief this was his first design and not that of the 98 cc Ducati Marianna, which followed two years later. Fabio thought that he could make count Giusseppe Boselli - head of FB Mondial - very happy with it. But because Mondial was succesful in 125 cc GP racing and a 75 cc world title did not exist he was not interested and introduced the young lad to signor Ceccato in the summer of 1953 . Ceccato 175 Sport Tipo 175, only 10 were built,14,5hp, 9500 rpm, 140-150 km/h. Vittorio Zitto and Orlando Ghiro at the Ceccato day in 2001. This was just what Pietro needed! He and designer Guido Menti started with the engine construction. The prototype with open valve springs in a temporary frame, constructed in a hurry, made it's first test rounds in the autumn of that year. The chain-driven over head camshaft, used cam followers with tiny wheels to follow the cam and produced a mere 6 hp at 10.400 rpm and the future of tipo ' Sport', 'Super Sport', 'Sprint', Tornado', or whatever name for this one-and-the-same bike was given, looked bright. Already in November of 1953 Angelo Marelli clocked 115 km/hr over the flying kilometer on the Monza racing circuit. By 1954 quite a number of racing bikes had already been built and eventually the power output, with an 18 mm carburettor, would reach 8,5 hp at 11.000 rpm. Menti and Pietro replaced the chain-driven camshaft by a train of gears. the oilpan got cooling fins and the open hairpin springs where enclosed by a case surrounding each spring. The frame, especially the rear swing arm, was renewed and that would be repeated a few times more. In 1954 Vittorio Zito finished 7th in the Milano-Taranto race and Eugenio Fontanilli first in the Coppa UCMI, Ghiro 1st in de Moto Giro di Toscane and 11th in the Moto Giro while Carlo Carrani finished first in the Trofeo Cadetti. In 1955 Ghiro finished 4th in Mi-Ta and Pozzoni 2nd in the Giro. 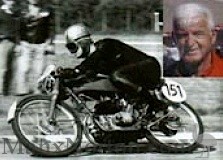 In 1954 Ghiro also broke world records on a partially streamlined 75 cc model in the 75 cc and 100 cc class on the Castelfusano circuit near Rome. On the 1 mile with flying start he clocked 134,672 km/h and also set new records for the 1 km flying start and the standing start. Supported by these successes Ceccato also added ohv four strokes to its streetbikes. Attractive and s p o rty 'clean design' 125 cc engines. The single cradle frame 6,2 hp 'Gran Turismo' with 16 mm carburettor and soon after the semi double cradle framed 'Gran Turismo S' with a 7,5 hp engine and 18 mm carburettor. Also a 150 cc GTS model was created and the top model in '54 was a 175 cc chain driven OHC bike of which not many were made. It was not difficult to produce a 100 cc derived from the 75 cc racer that delivered 11 hp at 10.500 rpm with a 20 mm carburettor. From this engine also a one time dohc version was made which made 11.500 rpm. On the first of January 1955 Orlando Ghiro and Vittorio Zito broke 14 world records in both classes. Also 125 cc and 175 cc racing bikes were made. The 125 got 13 hp at 10.000 rpm and about twenty were made. Ten 175 cc racers were made (in the FB-Mondial factory) and this bikes engine produced 14,5 hp. These bikes were not as succesfull as their smaller capacity family members due to stiff competition from Ducati and FB-Mondial in particular. 1956 turned out to be the crown year which Pietro, the 'Fondatore', would never witness. A few days after the new year had started he died suddenly af a heart attack. The company was taken over by another family company that did not change the course set out by Pietro. Zito won the Milan Taranto race in the 75 cc sports class . F rom the 32 bikes that started only 17 reached the final finish; 12 Ceccatos from which 'only' 9 finished with the first 10 bikes because Laverda got hold of the 4th position. Ghiro finished first in the Giro after winning all stages. In 1957 Fontanelli finished 2nd and that was the last year of long distance racing on public roads, due to deadly accidents in the Mille Miglia car race of that year. Victories were also reaped in motocross, grass track and hill climbs. In 1960 a new 24 hour world speed record was established on the French Monthléry circuit by Ceccato's racing chief Olindo Fongaro and famous French roadracing champion George Monneret. Due to a serious drop in motorcycle sales it was decided in 1961 that the production of motorbikes should be discontinued. The factory stock was l a rge enough to last untill 1963 when the last bikes were sold. Until the mid sixties Ceccato competed in the formula-2 races and in hill climbs competition. Pier Carlo Borr i took the 'Campionata Montagna' title in 1965 and 1966 . The company had some minor exports to Libya , France and Holland. Great sales were achieved in Argentina were during a certain period even more Ceccatos were sold than in Italy. Guan Zanella who started as a motorcycle producer in 1957 in Caseros near Buenos Aires and used the 100 and 125 cc 2-stroke engines in his own frames. The badge on the tank read 'Zanella-Ceccato'. Ninety percent were sold in Argentina, the remainder in surrounding countries and even in the USA were the Standard Atlantic Corporation of Miami took up imports in 1961. From that year on Zanella produced the engines themselves, also 50 cc bikes, with the machines and tools taken over from Ceccato. As of 1990 Yamaha engines were used untill the Argentinian dollar crisis forced Zanella to close all activities in 2002. From the total of 500 Taglioni racers that were built, great numbers were succesfull in Argentina. Also a couple of 125 - and 175 cc racers. Races like the 'Seia Hora', '300 Milas', Premio Alpi', etc. were tremendously popular. The Argentine 75 - and 100 cc 'Zanella-Ceccato' racers D'arminio, Galelli and Tamburri conquered many victories and championships. After the smallest racing classes were abolished and Japanes bikes took over many Ceccato racers dissappeared forever. But since the late eighties some people did several barn discoveries in Italy and Argentina as well. 'Registro Storico Ceccato' in Brendola is the club for all Ceccatos ever produced. The 'Ceccato Day' in Montecchio Maggiore is held annualy and many ex factory riders give 'acte de presence' and hand out signatures. Giampiero Vezzaro, the club' chairman, discovered a 175 cc racing bike in Argentina and repatriated it to Italy. Because motorcycles were only part of a wider range of products, Ceccato never had to close down as almost all of it's competitors did. At present the company is one of the largest producers of car and train washing machines in the world and has a global network of own offices and importers. Air compressors are produced for over sixty years now. Pietro's original plant at Via Bataglia 1 in Alte Ceccato was closed in 2002, it had become too small. Along the Milan / Venice highway, just outside Vicenza, a 60.000 m2 new factory was than taken into use. In memory and honouring of the company's famous motorcycle era, the reception at Via Bataglia held a permanent display of three brand new motorcycles from the final production year. Original document available on request.